At one time or another, we have all seen a movie or TV show where the kid goes fishing with a string on a stick. If only fishing was that easy. In reality, modern day fishing is nothing like that at all. It’s become a sophisticated sport that gives you all sorts of equipment choices. You can choose specialized equipment for everything from lake fishing to ice fishing. One of the most important pieces of fishing equipment is the reel. That’s what we will discuss in this article. We will go over the many different types of fishing reels that are available. Why is it important to be choosy when it comes to selecting a fishing reel? Because you should match the type of reel you want to use with the type of fishing you are doing. That will maximize the chance of you catching more fish and having more fun while doing it. Many of you can probably relate to this type of fishing reel being the first one you ever owned. They are so simple to cast and operate that even children can handle them easily. That makes this type of fishing reel a favorite among beginning fishermen and those who fish just to relax and pass time. They are also very popular among those that like to fish for catfish. Why are they so simple to operate? For one, Spincasting reels are very light in nature. That makes it very easy to control your fishing pole when using them. They also have a fixed spool design, so using lighter lures and baits with them is no problem either. This reel although very simplistic does offer some advantages to those that use. It does not cast super-far but it does cast somewhat accurately. If your line gets tangled it’s fairly simple to correct that with this style of reel too. This is also one of the least expensive types of fishing reels that are made. Why do more seasoned anglers not choose this style of reel? Since they are small they do not hold much line. That also makes it almost impossible to use a heavier test line with them. They are definitely not a good choice for fishing at deeper depths or when needing to cast long distances. If someone asked you what is the most popular type of fishing reel in use today and you answered a spinning reel, you would be absolutely correct. These are the preferred choice in reels for several different types of fishing. They are used by everyone from novice anglers to seasoned professionals. These were first used to cast the lighter lures that were needed to catch trout and salmon. Nowadays they are used in a wide variety of fishing scenarios. What’s unique about this type of fishing reel is the way you cast with it. These reels are always located to the underside of a fishing pole and have what is known as a bail on them. The spool of line is also located to the front of the reel. You first flip the bail open to make a cast. Once you have reached the desired spot with your cast, you then close the bail and you are ready to reel in a fish when you get one on the line. You can also set the amount of drag on the line with these reels. It gets its name from the way the line ‘spins’ back onto the reel. There really is no type of small to mid-size fish you can’t catch with these exclusively under the pole reels. They are popular for bass fishing in lakes and many surf fishermen use them too. These reels are simple enough for a novice fisherman to use and they help keep a rod and reel setup to the lighter side too. Anglers love the versatility you get with spinning reels too because you can use lures or live baits with them. The biggest drawback with spinning reels is that you cannot go after super-big fish with them. It’s never a good idea to use anything above a 10-pound test line with them. That also means they are not a great reel for fishing in heavy cover areas. There is a wide variety of spinning reels in the marketplace. They range from inexpensive models to fairly pricey professional quality spinning reels. We said that spinning reels were the most popular fishing reels but this style reel is a very close second. Many experienced anglers have trouble deciding which style reel they like best between a baitcasting and spinning reel. Unlike spinning rods, baitcasting spools are located directly in the center of the reel. One of the main features that sets baitcasting reels apart from spinning reels is they sit on the top side of a fishing pole. This changes both casting and retrieving very dramatically. As a matter of fact, if you have never used a baitcasting setup before, you will need to practice. We recommend you get some practice lures and find a wide open area to practice casting before you go fishing. Otherwise, you may be in for a frustrating day fishing with your new baitcasting reel. As the name suggests, baitcasting reels are great for making long accurate casts. The angler has more control over that cast than with any other type of reel. With a simple push of a button, the line being cast will come to a complete stop. That means you don’t overshoot your cast location as often as you do with other types of reels. They also are a great choice for reeling bigger or harder fighting fish. This is due to the fact they are designed with several gears built into them. As a result of these gears, just one revolution of the hand crank produces three turns of the spool itself. Overall baitcasting reels are very sturdy and tough too, which also helps when catching fish like Muskie, Alligator Gar, and Catfish. There are some major drawbacks with these types of reels too. As we mentioned, a beginning angler would probably not have much fun fishing with one. They are also prone to what is known as backlashes. That’s when the bit hits the water and stops but the line keeps on unraveling. It will eventually create a huge bird’s nest tangle on the reel that will be time-consuming to fix. This is the more traditional style baitcasting reel. It’s a round style reel that will hold more line and let you cast further than with other types of reels. They are built to withstand the rigors of catching larger and heavier fish too. Popular demand changes many types of products over the years and such is the case with baitcasting reels. No longer do you just find them in the big and somewhat bulky round shapes. Now more manufacturers than ever have come up with a lower profile and lighter baitcasting reel design. Low-profile baitcasting reels are not as prone to backlash tangled lines as round baitcasting reels are. Do you like to reel in big fish but don’t care to do much casting when fishing? Then you are one of those people who will like trolling. That’s when you let your boat and the bait do the work until the fish is on. It’s best done if you have one of these conventional fishing reels. They are specially made just for trolling enthusiasts and perfect for large lake, deep sea, and ocean fishing. Trolling reels have many of the same characteristics as baitcasting reels. Make no mistake about it though; these reels are not made to do any form of casting with them. They are a bulky and beefy fishing reel that has the frame strength and line capacity to land bigger fish. That includes large lake trout, walleye, musky and huge gamefish like marlin and tuna. Trolling reels are bigger and rounder because they have to hold the large amount of line necessary for deep lake and deep sea fishing. They also have to hold up to the tremendous stress that reels take when larger fish are on the line. Trolling reels have some special features that set them apart from other reels. For one, they are designed with a line breaking system added into them. Most will include a multi-disc drag system too. Conventional reels also have built-in highly audible clickers that allow you to easily hear when line is being dragged out. These features are all very necessary when going after big fish in bigger bodies of water. Trolling reels offer several benefits to those that use them. They allow you to easily fish at all different depths so you can quickly find a strike zone. Their stronger drag settings and the ability to hold larger line sizes is a big bonus when going after larger fish. Conventional reels have some drawbacks to using them. For one, they are not meant to be used at all by inexperienced anglers. They also tend to be very expensive reel setups. Trolling reels also are not made to be used for fishing from the shore, so if you don’t have a boat you can’t use them. These are traditional trolling wheels that have incredible frame strength and hold a lot of line. They are designed with two main purposes in mind. That’s for fighting extremely large fish and making that task as less taxing on an angler’s body as possible. They allow the user complete control over their lines. This type of trolling reel is a little more versatile than it’s more traditional cousin the open style trolling reel. That’s because it has a moving line guide that travels side to side as you let line out or reel in a fish. The level wind feature allows you to troll for some smaller species of fish too. You definitely do not want this type of conventional reel if you are going after bigger saltwater game fish. Fly fishing gets its name because the original lures that were used when doing it often looked like some type of fly or a bug. They are very popular for use in moving bodies of water. That’s because they work best when cast upstream and letting the current take the lure back to you. These reels were first designed to go after trout in creeks and streams. Nowadays though, you will find fly fishing reels designed to catch everything from such freshwater fish as salmon and pike to saltwater fish such as striped bass and tarpon. These are lightweight fly fishing reels that you will find a large selection in. They have a 1:1 retrieval rate (one turn of the crank equals one turn of the spool). A single action fly fishing reel is not a good choice for trying to catch large and fast running fish. These fly fishing reels have a higher gear ratio than single action fly fishing reels. That means their retrieval rates are much faster and you can catch bigger fish with them. Multiplying reels are heavier than their single action counterparts. They also cost more and have a more limited selection. These are bigger and heavier fly fishing reels that have an automatic retrieval system on them. This system makes it easy to cast multiple times in a row very quickly. They are the bulkiest type fly fishing reel and the most prone to failure with so many moving parts. Fly fishing reels have their advantages. This type of reel gives you the ability to cast even a very light fly an extremely long distance. That’s because they use the weight of the line to cast and not the weight of the fly. Another big advantage of using a fly reel is you can drop your fly into the water without making a splash. This way you do not easily spook the fish you are going after. There are some things not to like about fly fishing reels too. One of them is you need a great deal of room to work them. That’s because of how wide the cast is with them. These reels are also very difficult to learn how to perfect a cast with them. Whereas a spinning reel you can learn to cast in a day, fly reels take months or more to master. It’s hard to go to any beach vacation area in the USA and around the world and not find people fishing from the edge of the beach near the water. This is appropriately called surf fishing. Surf fishermen use heavy poles to haul in bigger fish and these poles require a little sturdier reel setup. There really is no such thing as a truly dedicated type of surf fishing reel. That’s because they come in forms that are similar to both baitcasting and spinning reels. Most people would choose a baitcasting type surf fishing reel if they were going after bigger fish species. For catching small to medium size fish from shore a spinning type surf fishing reel is fine. There are big differences between surf fishing reels and regular baitcasting or spinning reels too. They are slightly heavier versions of them and it’s an absolute must that they are built salt corrosion resistant. Surf fishing reels must also be made to withstand the rugged conditions that fishing in a sandy beach environment demand. Surf fishing reels are used to go after such fish species as striped bass, pompano, red drum, and bluefish. That’s because of the advantages these types of reels offer. For one, they can be used to cast long distances even into the wind. They hold lots of line and work great with cut baits, lures and live baits too. One of the drawbacks with surf fishing reels is their cost. Since they are bigger and more durable that’s to be expected. The materials that make them bigger and more durable also make them a heavier type reel. These are not one of the more popular types of fishing reels but they work great for what is known as ‘float fishing’. They are almost exclusively used with a ‘roe’ (a form of artificial fly) on the end of the line. When float fishing someone casts upstream and the float and roe come back to them. Centerpin reels are most commonly used for catching steelheads and salmon. Centerpin reels look very similar to fly fishing reels. They are very likely the forerunners to the first fishing reels ever made. The unique thing about centerpin reels is that they have no drag and no gear ratios. One of the advantages you get with these free spinning reels is you can maintain your line to the float without touching the water. This gives you a greater ability to feel a strike. Those who use centerpin reels claim it’s much fun because it’s just you against the fish. A big drawback with these reels is they are very difficult to cast and take lots of practice. They are also very expensive. A mooching reel is similar to a fly fishing reel. It’s designed to let out lots of line at a time. It has to do with one type of fishing only. That is fishing for salmon using dead herring as bait. This tradition goes back many years in the American West. If you want to visualize a ‘mooching reel’ think of a fly fishing reel on steroids. They really are much bigger than fly fishing reels. Why do you need to let out lots of line when fishing for salmon this way? It’s because it’s done by drifting or using a boat engine on idle. So you have to get your line out a good distance behind the boat. They also have very reliable drag systems built into them. Obvious drawbacks with mooching reels are they are cumbersome and heavy. They also can be pricey. Here is another close cousin of a fly fishing reel. Inline ice reels now completely dominate the ice fishing market. Over the years ice fishermen felt they needed to eliminate two things that were common when using fly fishing reels. This was to eliminate line twist and keep the lure from constantly spinning. Spinning spooks naturally suspicious fish like crappie and bluegill. Inline ice reels are designed to prevent both of these conditions. These reels often have a very audible click to them that lets you know when line is being taken out by a fish. Inline ice fishing reels are also great for fishing in shallower water. They do have their drawbacks too. They usually have a 1:1 gear ratio. That makes for some very slow retrieval times and the possibility of losing a good size fish. It also takes some time to master using inline fishing reels. These are mostly used for deep sea saltwater fishing as a time and energy saving reel. If your bait has been stripped off, you can use the electric retrieval system to effortlessly get the line back to your boat. This is essential for being able to recast quickly if you feel you are in a potential strike zone. Typical fish species these reels are used for catching include tuna, grouper, tilefish, and swordfish. Many come with modes that are used to adjust such features as retrieval speed and power. One of the biggest drawbacks of these reel systems is their cost. They also are not much good for catching anything but larger sea and ocean at depth. Electric fishing reels also need to be hooked to a stand-alone or boat supplied power source. You are also using an electrically powered device that is sensitive to moisture around lots of water. 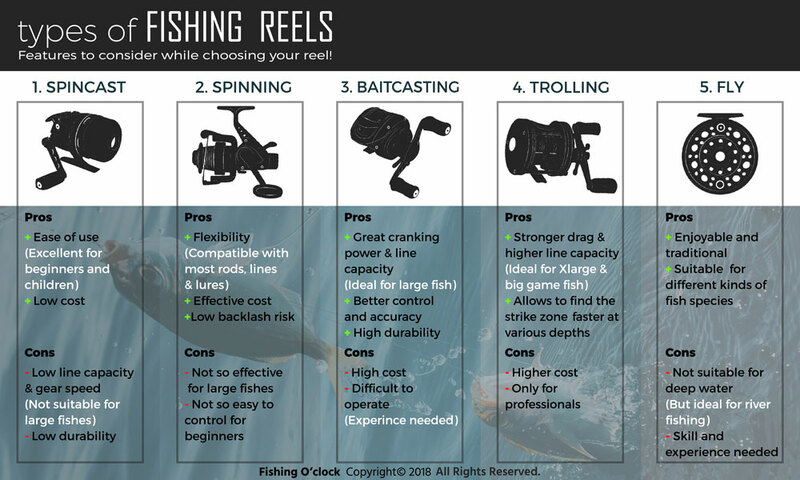 What we have given you here are a few basic guidelines that most anglers use when selecting a reel to use. With that being said, there is actually no right or wrong when it comes to the fishing reel you choose. For instance, I personally would not use a spinning reel to catch Salmon running in a river, but try telling that to an angler that just caught a 12-pound Salmon with their spinning reel setup. How do you know if a fishing reel setup is right for you or not? We suggest you try them out before buying. You can do that by asking to use your fishing buddies reel setups if they are different from yours. Maybe you are using a spinning reel while a boat mate is using a baitcasting reel. Some of the larger fishing supply stores will even have an area where you can do a trial casts. The bottom line is you have to find the best reel that works for the type of fish you want to catch, but even more importantly that reel has to be enjoyable for you to use while fishing.